A bewildering mash-up of gym, megachurch and rave, the cycling program’s overall vibe sometimes borders on creepy. But for the initiated, it’s a community. If someone had asked me what SoulCycle was before I went, my best guess would have been a hip-hop cycling class for black folk. So imagine my surprise when I walked into the South Lake Union SoulCycle to find a crowd of mostly white women, mostly clad in leggings and sports bras — clearly the unofficial uniform of the SoulCycle elite. The elites were at the front of a messy line leading to the studio doors, which they stared at with visible anticipation. Beyond those doors was something less surprising but certainly discomfiting: a semipermeable barrier of body odor that smacks you in the face when you walk in. From the outside, the big windows and brightly-lit interior seemed to promise an airy paradise of bleach-white sweat towels and lavender hand soap. (To be fair, there were bleach-white sweat towels; I didn’t check to see what scent the hand soap was). So the oppressive humidity and the smell of sweaty human bodies may leave you momentarily disoriented. The toe-clips of my rented cycling shoes did not make me feel any more grounded. As cycle-fiends and newbies made beelines for their preselected bikes, I sighed with relief that my own reserved bike was in the very back corner, right next to a glowing red exit sign. With a chorus of snapping sounds, my fellow cyclists locked their feet into their bikes. A staffer helped me follow suit, and then took away my phone after spotting it in the bike’s cup holder. 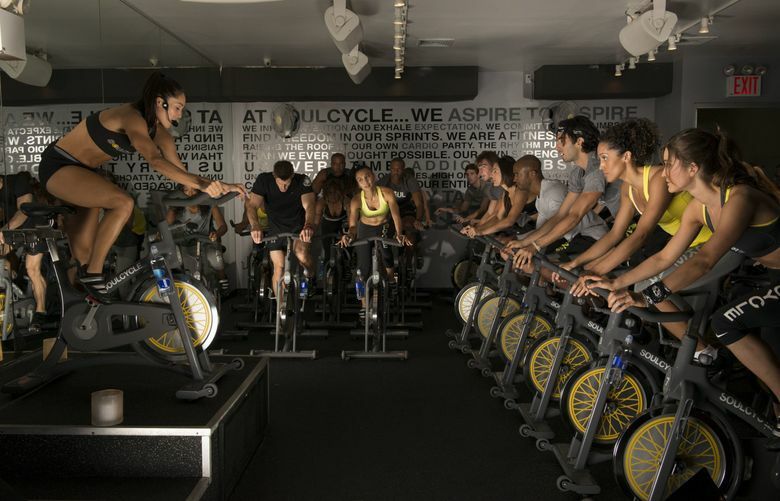 Phones are banned in SoulCycle classes to give participants “time to focus on themselves.” The doors were shut. The red glow of the exit sign suddenly seemed far away. “I’m going to die,” I whispered to my neighbor, and even I wasn’t sure if I was making a joke about the intensity of the forthcoming workout or my irrational fear of being sacrificed by some kind of Lovecraftian “Mean Girls”-style cycling cult. On Wednesdays, we wear the sweaty skin of noobs! With the vocal cadence of a motivational speaker, the trainer introduced himself, welcomed newcomers and gave us the cycle studio equivalent of an in-flight safety demonstration. Then the lights went down, the music went up, and some of those bra-uniformed acolytes began pedaling at a rate that one can only call possessed. The leader bopped along on his bike, cooing motivational commands into his headset. What followed was a bewildering mash-up of a megachurch and a rave, albeit a shockingly rhythmic rave. While I failed hopelessly to master their synchronicity, the SoulCycle veterans moved with unflagging fervor, bopping side-to-side in near-perfect unison to the beat of a bhangra song. “Push hard in here, so you can face the world outside those doors,” said the trainer, who insisted that we put our souls into this workout. “Otherwise it’s just CycleCycle!” he semi-shouted. Laughing at the reminder of the kind of “soul” I had been expecting, I accidentally fell out of sync and, as if being punished by the SoulCycle gods, my leg jerked violently downward in my toe-clips. Shaken by the dangerously strong grasp of my toe-clips, I took a breather. The lights began to come up and the music softened, and, in a diminished, slightly sad tone, the trainer began relating a story about his friend moving away, saying he works through personal challenges like that on the bike. He encouraged us to do the same. Between the blasting music and the onslaught of inspirational anecdotes, I don’t think I could ever focus enough to work through any of my own personal challenges here, but I did suddenly understand the other riders’ intensity. What had at first appeared to be a cultish, stationary version of a motorcycle gang was in fact a community and a sanctuary, maybe even a church; people really were working through difficulties in this dark room, pushing themselves harder than they could go alone. SoulCycle instructor Evan Arbour, whom I spoke with later, affirmed the idea that SoulCycle is about connection. “The workout is kind of a bonus for us. People come back for the community,” he said. After a few more rounds of bopping and handlebar push-ups, it was time to cool down. A couple of riders bolted, but the rest of us stayed for stretches before taking off. After the room had mostly cleared, I freed my feet, then took the trainer up on his offer to come meet him after the class. As we shook one another’s dripping, sweaty hand, he gave me a big smile and kindly told me I did a great job, making no mention of my failure to master the bounce. Arbour thinks skeptics like me should give it a second try. The second time is easier, he said, because you know what to expect. “So you can be like ‘OK, now that I know all of that’s happening, how can I kind of focus on the stuff that I didn’t quite get the first time,” he said. “And then it kind of opens you up to more of what lies underneath the workout, what lies underneath the class itself, which is the connection between people.” Arbour shared endearing stories about families that have connected through SoulCycle, including one about his own mother showing up to class in jeans.